Like their seniors on BZS1422, Meimei and Kananan begin the show with everyone’s favorite topic this time of the year: summer fatigue. Meimei says that she does tend to get hit with a bad case of summer fatigue at least once a year, especially when S/mileage are doing outdoor events. Kananan admits to the summer having an effect of sapping her energy to the point where she can be just walking outside when she’ll be suddenly hit with a brooding feeling of “…what am I even doing…?” Meimei says that happens to her around May — this is known in Japan as the May Disease. Meimei mentions that their leader Wada-san just had her birthday on August 1st and asks Kananan for a comment on this. Wada-san turned 20 which, in Kananan’s mind, makes her cool because she can now legally drink alcohol — though according to Wada herself, she isn’t going to pick up on that habit. Kananan’s image of Wada-san prior to her joining S/mileage was that she had a really childlike image and way of speaking, but now she’s completely different and is very adult-like. “People sure do change,” says Kananan. Kananan: But now she’s gotten so tall, no one could’ve predicted it. Following this astute observation, Kananan adds that she’s always watching Kumai-san and her great figure at H!P concerts and so, marveling at how pretty she is. She says she really admires Kumai-san and says she can understand why Fukuda-san is such a big fan of hers. Apparently Fukuda-san and Kumai-san even met up the other day in their private time. Kumai-san will often come to S/mileage’s dressing room to hang out, too, and she became good friends with S/mileage during Lilium. 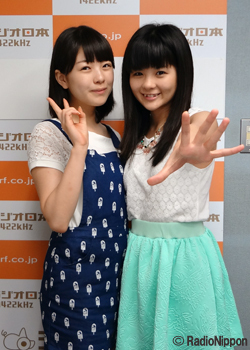 This is a corner in which listeners send in ideas for basically these fictional little radio dramas, irrelevant to S/mileage to H!P, that Meimei then acts out on the show. I’m not sure there would be much point in summarizing them here, although I will consider it if there is demand for it. I recommend checking out the actual radio show if you’d like to hear these. Fan letter #1: The listener attended S/mileage’s Budokan concert and wanted to send this letter just to convey his thoughts about it. He starts by saying that it was simply the best. He was nearly brought to tears by the emotional opening followed by aMa no Jaku, and the intro of the second song, Yume Miru 15sai, gave him the chills. He says the setlist was full of songs he loves. He also thought the “internal conflict within S/mileage” video was funny, and he loved the performance of Tachiagaaru. He talks about how even though in her sub-member days Nakanishi was just your everyday, average girl barely able to keep up as a back dancer, watching her doing Yattaruchan so confidently really made it sink in how much she has improved in both singing and dancing. (Kananan is embarrassed reading this.) The listener says he has been a fan of S/mileage ever since their indies days (Meimei: “me, too!“) and literally says that he sees “nothing but light and hope in S/mileage’s past, present and future.” He says attending the concert made him glad to have been a fan of S/mileage all this time, thanks the members for the dreamlike concert and says he’s looking forward to their future activities, too. Fan letter #2: This listener, too, attended the Budokan concert and says that especially the “internal conflict within S/mileage” VTR left a big impression on him. The listener says he’s a Kananan/Meimei double-oshi, so he’s definitely a firm supporter of their team on the video. He asks the two to share any funny inside stories as to what happened behind the scenes when shooting it. Kananan says she’s happy to have received feedback from lots of people saying that they were scary in it, but says that whenever they’d finish a segment of it, they’d actually burst out laughing so hard they’d be falling off their chairs. Meimei’s and Kananan major complaint about the video, though, is that while the other two teams were shot from above and made to look all cute, for some reason these two were shot from below which they say made them look really ugly. They both admitted to even shedding some tears over the fact how the video on which they apparently look so ugly would be shown to everyone at Budokan. Looking back, though, they’re glad their segment was the way it was and hope that they’ll get to do a continuation some day. Meimei: This week’s episode of SS1422 is almost over. It sure feels lonely. Right, Kananan? Meimei: Oh. Well I guess not, then. If these two girls are worried about looking ugly in some camera angles, what hope is left for the rest of us? And by “us” I mean Rinapu. i can imagine them laughing crazily after shooting that interal conflict video lol! Omfg I loved how Meimi and Kanana mentioned in that video none of the 2nd generation of S/mileage got a photobook yet, but MM members and even Karin got one. That is so true actually haha.